One of the most redeeming qualities of the bitcoin community is their generosity. For every scammer trying to take advantage of the blockchain’s anonymity, there are multiple others giving transparently to a cause in which they believe. From the original Wikileaks campaign, which arguably put bitcoin on the map, to the current Free Ross movement, there is no shortage of organization’s taking advantage of bitcoin’s frictionless ability to cross borders and replace traditional payment systems. This first ever ranking of bitcoin donation addresses is easily led by Gavin Andresen’s original faucet addresses. 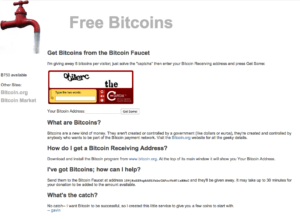 This faucet originally gave away 5 BTC just for solving a captcha when it first went live in July 2010. Talk about generous! The total received balance on these addresses is almost three times that of the second ranked Bitcointalk Forum address. The popular Free Ross Ulbricht campaign address currently ranks #12. Free Snowden ranks #25. An Interview with Jeremy Sturdivant aka “Jercos”, the young man who sold two pizzas for 10,000 BTC in what would come to be recognized as the first transaction involving a tangible good or service in bitcoin history. Now recognized as “bitcoin pizza day”.